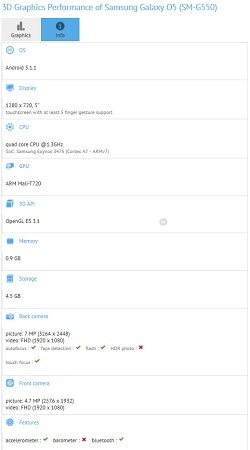 While we had recently heard about Samsung working on a new Galaxy O series, one of the handset in the series has now showed up at the benchmark. A yet to announced Samsung smartphone – the Samsung Galaxy O5 with model number SM-G550 has surfaced at the benchmarks. According to the listing, the handset seems to be an entry level offering from the company. However, there is still no word on the launch date or the pricing of the handset but we can expect to see it in the next few months. The listing reveals that the Samsung Galaxy O5 would flaunt a 5 inch display with resolution of 1280 x 720 pixels. The smartphone is apparently powered by the quad core Exynos 3475 processor with Mali-T720 GPU, 1 GB of RAM and 8 GB of storage. Interestingly, the handset runs on the latest Android Lollipop version.